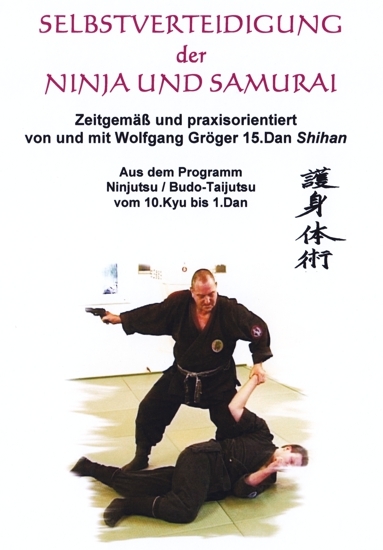 This DVD (1 hour 34 minutes) understandably demonstrates contemporary and practical Self Defence, by and with graduate engineer Wolfgang Gröger Shihan 15th Dan (Menkyo Kaiden Kugyo Happo Hiken) Bujinkan Budo-Taijutsu (Dr. Hatsumi / Japan) and 12th Dan Goshin-Taijutsu (IAWO), from the training program Budo Taijutsu / Ninjutsu from 10th Kyu to 1st Dan(black belt). The shown techniques are eventually modifiable for combat sportsmen, combative trainers, self defence teachers and other interested people. Content: Defence against: grabbing the wrist ( one and two sides, diagonally and from behind), embracing the body (from the front, from behind, around the neck), grabbing the jacket (one side, two sides), grabbing the neck (one and two hands from behind), grabbing the hair (from the front and from behind), headlock (from the side and from the front), double nelson, stranglehold (from the front, from behind, from the sinde and on the floor), fist beats and punches, head punch, knee beat, foot punches and kicks, knife (from upside, from below, from the side, from outside and inside, from a not obvious direction), stick attacks, flexible arms, everyday objects, firearms (from the front, from behind and from the sinde, special situations), several aggressors.